Circa 1990's, this vintage alhambra gold necklace by Van Cleef & Arpels is both simple and elegant. 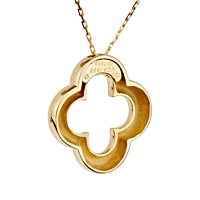 The classic pendant necklace, in an open Alhambra design, is finely crafted in high polished 18kt yellow gold with rounded, concave edges. 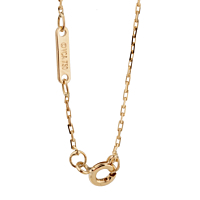 Underneath is a tiny, solid gold nameplate with the Van Cleef hallmark, while it drapes gracefully from an oval link chain with a closed clasp.